I love fall, maybe it’s because I’m a Fall in coloring, but I believe it’s because we get to break out the comfort food. Soups, hearty pasta, roasts, root vegetables. Yes I’m sorry to see the beautiful fresh summer produce go, but I’m ready for the nip in the air, the turn of the leaves and the comfort of warming food. We are blessed to live in a state where we have the beach and the mountains in easy access. We get to enjoy four full seasons and have the full splendor of nature all in easy reach. This month’s recipe isn’t about mountains or even the outdoors, but enjoying a bowl during this fall season is sure to bring a smile to your face. Cook the chicken in a pot with other aromatics to make stock which you can then use in the soup or you can grill the chicken and cube the meat into the soup to add heartiness. If you don’t have any chicken and just have the stock its fine and actually more traditional because in the kitchens south of the border the chicken meat would go into other dishes while the stock would be used alone for the soup. Roast the Garlic, Onion and Tomatoes in the oven or in a cast iron skillet. The goal is to add some char to the Garlic and Onion and blister the skin on the tomato. It does add some time to the dish but it will fill your house with a wonderful aroma and adds a smoky depth to the soup. Peel and seed the tomato, then blend all three with a bit of the stock to puree. Heat a tablespoon of oil in a large sauce pan and pour in the blended garlic/onion/tomato cook this for about 5 min or until the color changes from bright red to a brick color. Add the rest of the stock, the cilantro, the diced dried chilies, cubed chicken if using add salt and pepper to taste. The quantities of these should be adjusted to your liking some folks love cilantro for me a little goes a long way, I like heat so the peppers add a nice warming spice to the soup. While the soup is coming to heat, about 15 minutes, warm oil and fry the tortilla strips. Or if you don’t want the hassle of frying your own use heavier commercial as the light chips go soft very quickly in the soup. To serve put some chips in the serving bowl, add the soup, top with some avocado and cheese with a dollop of the crème fraiche on top. 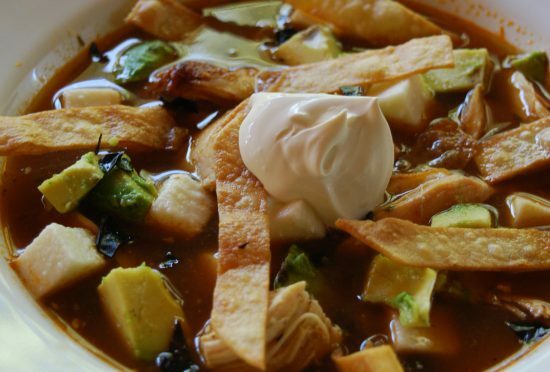 This is Mexico in a bowl simple with layers of flavor and texture.